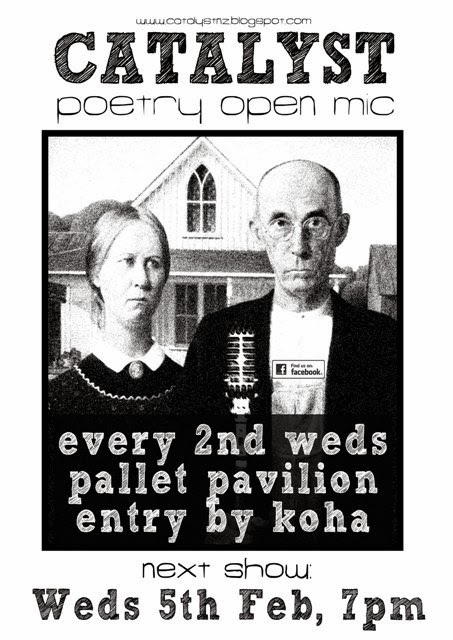 The Return of the Return of the Open Mic! Announcing the second, or maybe third coming of the legendary Catalyst open mic. We're having a summer season at iconic Christchurch venue - the Gap Filler Pallet Pavilion (you can't miss it, it's a giant blue construction made out of wooden pallets) located on the corner of Durham and Kilmore Sts known as 'The Commons'. That's right the summer season will feature fortnightly shows on Wednesday nights starting 5th February at 7pm and hosted by Doc Drumheller and Ciaran Fox. Entry is by koha (donation). We look forward to seeing everyone again - open mic slots will be limited, first in, first served. Come along and keep poetry alive in the CBD! Greetings and salutations for 2014. We couldn't resist it, another quick showcase in the Road Show style to kick off 2014. 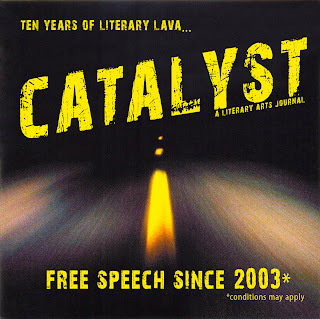 Catalyst’s first show of the New Year features live music and readings from: Ben Brown, Andy Coyle, and Doc Drumheller. Copies of Catalyst Literary Arts Journal and books by the poets will be available for sale. A limited edition chapbook will be offered as a free gift for each copy sold of the journal. Hurry while stocks last!